Are Canada’s laws against the possession and cultivation of cannabis to go up in smoke? Canadians now begin to wait for the Court of Appeal for Ontario to make that call. The appeal court yesterday wrapped up two days of hearings of the Crown’s appeal of Justice D.J. 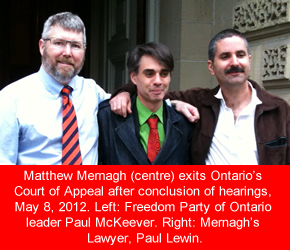 Taliano’s April 11, 2011 trial decision in the case of R. v. Mernagh. The Court of Appeal could take days or weeks to render its decision, but the history of the time taken by Ontario’s highest court to make decisions about the constitutionality of Canada’s cannabis laws suggests Canadians will be waiting between 2 and 6 months for the answer. What follows is a brief explanation of Justice Taliano’s decision, and an overview of the main arguments made on appeal; the arguments to be weighed by the Court of Appeal as it makes its decision. “ Matthew Mernagh is a seriously ill young man. He suffers from the debilitating effects of fibromyalgia, scoliosis, seizures and depression. He lives with constant pain. Prescription medications have failed to provide adequate relief for his condition, and in many ways, they create additional problems. Marihuana, used medicinally, eases his symptoms and allows him to function. Mr. Mernagh cultivates his own supply. The Ontario Court of Appeal has recognized that it is a violation of s. 7 of the Canadian Charter of Rights and Freedoms, Part I of the Constitution Act, 1982, being Schedule B to the Canada Act, 1982(U.K.), 1982, c. 11, to deprive a person with a serious illness for which marihuana provides relief, of the right to use marihuana to treat his illness (R. v. Parker, 146 C.C.C. (3d) 193). As a result, the government has created a legislative framework, the Marihuana Medical Access Regulations, SORl200 1-227 [MMAR], to allow such individuals to legally access, possess, and cultivate marihuana for medicinal purposes by obtaining a licence to do so. A licence is obtained by completing an application which includes the signed declaration of a supporting medical doctor. However, Mr. Mernagh has been unable to find a doctor to sign his declaration. As a result, he has been unable to obtain a licence to possess or cultivate marihuana under the regulations. Therefore, despite his undisputed and serious illness, and despite the relief he gets from the medicinal use of marihuana, Mr. Mernagh’s cultivation of marihuana for his personal, medical use is illegal. He comes before this court because he stands charged with the offence of production of marihuana, contrary to section s.7(2)(b) of the Controlled Drugs and Substances Act, S.C. 1996, c. 19 [CDSA]. As an individual whose liberty is at risk as a result of pursuing his medical treatment of choice Mr. Mernagh contends that this prosecution violates his rights of liberty and security of the person under s. 7 of the Charter. He argues that the combined effect of the MMAR and the provisions relating to marihuana under the CDSA are unconstitutional and he seeks a declaration of invalidity with respect to the offences of possession, cultivation and trafficking in marihuana contained in the CDSA. The Crown submits that the problem that Mr. Mernagh is experiencing in accessing marihuana for medicinal purposes, is not the fault of the legislation, but with the doctors whose decision to sign or not to sign a declaration for a patient is theirs alone and is not subject to government control. Justice Taliano received into evidence the accounts of numerous individuals suffering from a range of illnesses and symptoms, all of whom report that cannabis had a beneficial impact upon their conditions. These individuals had, to one extent or another, found it difficult or impossible to get a physician to sign the declaration they needed to obtain an exemption. He found that, because the MMAR makes physicians the gatekeeper for exemptions, and because too few physicians – for a wide range of reasons, including ignorance about the effects of marijuana use, worries about losing their licence or insurance coverage, etc. – agree to sign declarations for people who are entitled to exemption, the MMAR is unconstitutional. He struck down the MMAR accordingly. And, because the prohibitions against possession and cultivation apply to uses for any and all purposes (i.e., including those who have a constitutional right to be exempt from prohibition), Justice Taliano declared that the sections of Canada’s Controlled Drugs and Substances Act prohibiting possession (section 4) and cultivation (section 7) are unconstitutional, hence non-existent in law, with respect to cannabis. He also stayed (i.e., cancelled) the cultivation charge against Mernagh, whom he found to be a patient benefiting from the use of cannabis as medicine. The Crown appealed Justice Taliano’s decision. 3 if the Crown is wrong about 2: that the infringement of section 7 is justified under section 1 of the Charter because the laws impose a limit on rights/freedom that is reasonable in a free and democratic society. The bulk of the Crown’s submissions concerned the first prong of its argument. The Crown emphasized that whereas only 499 physicians had signed declarations at the time Hitzig was decided, by 2008, the number of physicians who had signed a declaration had grown by over 400% to 1887. To that submission, Justice Simmons made the comment that the statistics do not show how many physicians were asked to sign a declaration in each year, such that there is a lack of context for concluding that 1887 represents an improvement. Justice Doherty asked the Crown if it could agree that a majority of the medical community is on-side with the idea that the declarations should not be signed. The Crown replied that it did not think the evidence in the record of this case supported that conclusion. Justice Doherty then asked if the Crown could agree that all of the major medical organizations have changed their positions on whether or not declarations should be signed. Again, the Crown was unwilling to concede that, stating that there was not evidence in the record to support that conclusion. There were more doctors in 2008 than in 2003 that were willing to sign, but the evidence was silent on whether a majority or a minority of physicians are willing to sign, added the Crown. The Crown’s repeated submission that there was insufficient evidence seemed to puzzle the panel. Mernagh had tendered the evidence of almost two dozen patients who had faced difficulties in their attempts to get declarations signed by physicians. Perhaps to suggest that that should be a sufficient number, Justice Doherty asked Michaelson, perhaps rhetorically, how many people one has to bring to court to prove there is a problem. Michaelson focused on the quality of the evidence. When he submitted that it is not sufficient for patients simply to testify that cannabis “works for me”, Justice Doherty replied that Crown counsel seemed to be playing-down the evidence that was tendered at trial; that the evidence was not so trivial as the Crown was suggesting. With respect to factual finding a), the Crown submitted that the trial judge could not find patients to have been “entitled” without first having medical evidence of entitlement; evidence that, it submitted, had not been tendered at trial. The Crown argued that the court was unjustifiably substituting its opinion re: entitlement for the opinion of physicians. The Crown spent a considerable amount of time suggesting that finding b) was based upon an erroneous use of a study (referred to at paragraph 158 of the trial decision). Specifically, the Crown submitted that the study’s findings did not support Justice Taliano’s conclusion that “many of the physicians named in the patient affidavits have been arbitrary and biased in their rejection of their patients’ requests for approval of the drug”. However, a careful reading of Justice Taliano’s decision makes it clear that Justice Taliano did not base finding b) upon the study itself. Rather, the trial judge found “as a fact that many of the physicians named in the patient affidavits have been arbitrary and biased in their rejection of their patients’ requests for approval of the drug and have not addressed their minds to the criteria in the regulations as a basis for their refusals”(emphasis added). Although the panel did not say so, this author submits that the “vast the text of the trial decision indicates that Justice Taliano’s finding b) was based not upon the study, but upon the affidavit evidence before him. The views expressed in the study, he said, “would clearly account for some of the more bizarre reactions by physicians described in the patient evidence” (emphasis added). With respect to factual finding c), the Crown did a break-down of the evidence. It said that of the 23 patients whose evidence was tendered at trial, one third (1/3rd) ultimately were successful in getting signed declarations. Another third (1/3rd) had conditions for which cannabis is counter-indicated (i.e. in which there is a reason for not administering cannabis). The remaining third (1/3rd), said the Crown, had made “only relatively minimal” efforts to get a declaration signed. With respect to factual finding d), the Crown submitted that, to know that the “vast majority” of doctors have refused to sign declarations, the judge would have to have had evidence before him both of the number of individuals who are entitled, and the number of doctors who have declined to sign. The Crown submitted that that evidence was not in the record. The Crown then moved on to the second prong of its argument. It argued that none of the witnesses provided medical evidence of entitlement to an exemption. It argued further that, even were they entitled, their failure to get a signed declaration was due not to the legislation, but to the decisions of physicians. The Crown argued that the Charter only applies to the actions and omissions of the state, that physicians are “non-state actors” and that, accordingly, physician decisions not to sign a declaration cannot violate section 7 of the Charter. The Crown spent less time addressing the third prong of its argument: that, if the law violates section 7, the limit imposed by the law is justifiable in a free and democratic society, such that it should be saved rather than being declared unconstitutional. After an animated to and fro between Michaelson and Justice Doherty concerning whether or not s. 1 could save the provisions in question, the latter remarked with a gentle smile that Mr. Michaelson “may have to stick this [i.e., the s. 1 argument] in the loss column”. The Crown finished its submission with a request that, should the court strike down the MMARs and the prohibitions on possession and cultivation, that the court suspend its decision for a period of “at least one year”. Mernagh’s stay, he submitted, should remain in place. Justice Doherty then said to the Crown Attorney that it “really troubles me”. What, he said, does a person do when he is really sick and cannot spend the time going from doctor to doctor looking for one who will sign a declaration; complaining to the College of Physicians and Surgeons about doctors who won’t sign (which was an option the Crown Attorney said is available to people), etc. “No remedy?”. Michaelson replied “I guest he might have no remedy”, but added that some in the past have managed to marshal sufficient medical evidence in a court case to establish an entitlement to constitutional exemption from prohibition. For the Respondent, lawyer Paul Lewin first addressed the four findings of fact (a through d) attacked by the Crown in the first prong of its argument. He implored the court: if they were to read nothing else, read the affidavits of the patients. Their full statements would provide the broader context – their medical and logistical difficulties, the nature of the comments and actions of physicians etc. – needed to understand that the Crown’s submission (that the patients had not tried very hard to find a doctor to sign their respective declarations) was false. With respect to factual finding a) (that “All of [the patient witnesses in the Mernagh case] ought to qualify for an exemption”), Lewin explained that “all” of the patient witnesses had medical conditions, all got relief from cannabis, all had tried other treatments/medicines, and all should be exempt pursuant to the MMARs. Justice Doherty sought clarification on the Respondent’s position on getting a physicians signature. He pointed out that, if the Respondent was arguing that a person shouldn’t need a doctor’s signature, the Respondent would be in effect asking the court to overrule what it said in Hitzig. He asked Lewin if the Respondent’s position was that requiring a physician’s signature is per se unconstitutional. Lewin replied that, no, the requirement for a signature could be made constitutionally sound by, for example, satisfying 10 criteria laid down by the Canadian Medical Association in 2003. Among the criteria: that a registry of physicians be made so that patients needed a signature would know which doctors to approach; clinical trials supported by treatment protocols; the provision of education about cannabis; liability protection for physicians; etc. Lewin called this the “template” for fixing the MMAR. Lewin then proceeded to recount the history of the regulations surrounding medical marijuana. From 2001 to 2005, the government had studied the doctor-as-gatekeeper system and found it did not work. It accordingly made amendments to the MMARs in 2005. Lewin explained that, pursuant to the 2005 amendments, a physician no longer had to make a statement to the effect that the benefits to a patient of using cannabis would outweigh the risks. The Crown, he said, had submitted that a physician now has to act in the “best interests” of his patient. Lewin argued that, if it is extremely difficult for a physician to know that benefits outweigh risks, how can a physician know he is acting in his patient’s “best interests”? In effect, said Lewin, the 2005 amendment didn’t change anything. However, submitted Lewin, the government since 2005 has “just looked away” from whether or not the system was functioning effectively. Justice Doherty asked Lewin if he agreed that there had been a “substantial increase” in the number of signing physicians since the 2005 amendments. Lewin acknowledged that there had been an increase in the number of signing physicians, but said he could not agree that the increase was “substantial”. The raw numbers are not the issue, he said. Lewin quoted the court in Hitzig, arguing that what is relevant is whether the evidence now before the court suggests barriers exist to eligibility, such that the court should re-examine the remedy it provided in Hitzig. Lewin then proceeded to review the arguments made and evidence tendered at trial concerning the role of the pharmaceutical industry in doctor prescribing habits; the marijuana stigma that, the trial judge found, causes physicians to make arbitrary and biased decisions; and the government statistics that fail to show an improvement in providing eligible patients with exemptions. Lewin cited statistics to the effect that the number of physicians signing declarations differs dramatically among regions across Canada having similar populations. Implied in that submission was that one would not expect the number of physicians to differ greatly in similarly populated regions, if one assumes that incidences of illnesses well-treated with cannabis are roughly equal from region to region. Therefore, something other that patient eligibility would have to account for the widely differing numbers of physicians willing to sign declarations in each region (things like stigma, fear of legal repercussions, physician ignorance of cannabis, etc.). He submitted that, having relied in part on the evidence of the patient witnesses, Justice Taliano had not made a factual error in respect of their eligibility, or in respect of physicians’ unwillingness to sign declarations for any patient. In support of the weight of patient evidence, Lewin pointed out that witnesses were volunteering very personal medical information and were admitting using a prohibited substance (cannabis) knowing that such admissions potentially were admissions of breaking a law. Lewin then referred to the part of his factum that dealt with the benefits of cannabis and with alleged risks associated with its use. He submitted that sometimes cannabis helps not just one symptom but many; that cannabis is safer than many other conventional drugs, including many over-the-counter drugs; that there has never been a recorded case of cannabis overdose (he cited the Malmo-Levine case in connection with this point); that users can “self-titrate” the dose; that users do not have to smoke cannabis, so alleged dangers related to smoking are a non-issue; and that a report did find cannabis helpful to glaucoma. With respect to harm to patients, Lewin focused on the facts related to patient witness F.F.. F.F.’s pain was so bad in his lower torso that he had spoken with his physician about severing his spine to relieve his chronic pain (note: this fact appeared, understandably, to have a significant impact upon the panel). F.F.’s request for a signature was refused by his first neurologist, but his next neurologist signed his declaration for the years 2003 to 2005. That neurologist retired, and the next neurologist refused to sign. F.F. has not gotten a physician to sign his declaration since then. Lewin submitted that F.F. did not slip between the cracks. Rather, he did everything he could do, including writing to members of Parliament and of the Provincial Legislature, writing to Health Canada, writing to the Nolin Commission (a Senate commission), etc.. Lewin submitted that it cannot be said the F.F. was not entitled because F.F. in fact had his declaration signed by a physician from 2003 to 2005. Lewin next dealt with the issue of whether it is acceptable for a patient to fall through the cracks or to be left behind pursuant to legislation. He cited the Morgentaler abortion case. However, the Honourable Justices proceeded to ask a number of questions that largely took Lewin off of the planned course of his submissions. Justice Doherty asked if it was the case that the Respondent thought striking the provisions was the correct remedy should there be a finding of unconstitutionality. Answer: yes. Justice Doherty replied that, surely, every governmental system lets someone down some of the time, such that, if striking the legislation is the proper remedy, numerous governmental regimes would fall due to having failed one or more individuals who fell between the cracks. Lewin replied that there “has to be a safety valve”, without which, striking the legislation is appropriate. Lewin submitted that, although he does not know what the court will find about the existence of a systemic problem, his submission was that, at a minimum, there was some evidence of a systemic problem. Justice Doherty wanted to know what would make the system constitutional. Would it be sufficient for the government to set up a registry of doctors willing and able to determine the propriety of signing a declaration? Lewin seemed to respond in the affirmative, saying it would be good if Health Canada were to put such a registry on its web site. After fielding Justice Simmons’ question about why there isn’t an informal registry, Lewin continued with his review of the patient evidence. In one case, a physician escorted a patient out of his office by the elbow for having brought the physician a waiver for his signature. In another, the patient told her physician that she was using cannabis medicinally: the physician refused to sign the declaration and, instead, reported the patient to the Ministry of Transportation such that the patient’s licence was suspended. In another case, a request by a patient that the doctor sign her declaration found the doctor covering her ears and saying “la la la la, I can’t hear you”. In another case, the Crown submitted the patient was counter-indicated for cannabis, but there was nothing in the evidence to substantiate counter-indication. Justice Doherty subsequently expressed his understanding that the Crown is submitting that no medical evidence of entitlement was tendered by the Respondent. Lewin responded, again, that the Hitzig case stands for the proposition that patients’ anecdotal evidence proves entitlement. Justice Doherty asked Lewin how anyone can question a physician’s opinion that some other, conventional treatment is better than cannabis. How, he asked, does such an opinion prove that the system is broken? Lewin replied that such a position assumes that the physician knows something about marijuana. Justice Doherty replied: what evidence is there that the physicians lacked such knowledge? Lewin’s reply: that the physicians, in the evidence, aren’t asking their patients questions about the effects of cannabis as one would expect were they to have or want to have such knowledge. Lewin thereafter submitted that physicians often prescribe opioids without adequately knowing their effects. Yet the side-effects of opioids are much worse than those of cannabis, he submitted. Lewin gave examples of physicians telling patients that they simply would not sign a declaration. In some cases, physicians refused to admit that they even discussed cannabis as medicine with their patients. He discussed physicians’ fears of legal repercussions. Ultimately, Lewin said, the exemption is a criminal defence. It shouldn’t be a matter of “luck” to get a signed declaration, he said. A patient shouldn’t have to lose his legal defence because his physician retires (as was the case with at least one witness). He shouldn’t have to move to another province to avoid prosecution. Lewin then turned to a number of other issues relating to the Crown’s submissions. The Crown had made a point of saying that the trial judge had “failed to carry the decimal point” with respect to one of the statistics cited by the trial judge. Lewin’s reply: it is not as though the trial judge based his decision only upon a flawed calculation of a percentage: the raw numbers were known to the judge and, in any event, the numbers are still miniscule. Concluding his submissions, Lewin turned to the issue of what remedy should be imposed. He submitted that if a breach of the constitution is found, and a declaration is made striking down legal provisions, but the effect of the declaration is suspended for some period of time, the stay of Matt Mernagh’s charges should remain in place. He explained that Mernagh suffers from scoliosis, fibromyalgia, and a separated shoulder. Mernagh’s physician would have signed a declaration in 2003 but for the fact that, at he time, the regulations required a specialist similarly to sign-off on the treatment. Also, he asked that Mernagh continue to be allowed to cultivate the cannabis he uses. Counsel for the Canadian Civil Liberties Association (“CCLA”) submitted that the problems with the MMARs are both factual and legal. However, the CCLA focused primarily upon the legal problems. Specifically, it expressed concern that, pursuant to subsection 6(e) of the MMARs, as they were amended in 2005 (well after the decision in R. v. Parker), a physician cannot sign a declaration unless conventional treatments have been tried or considered and found to be ineffective or inappropriate. The implication of this requirement is that the regulations are such that physicians are not free to exercise their best judgment. As a practical example, if a physician believes that a conventional drug will reduce a patient’s pain from level 9 to level 7, but cannabis would reduce it to level 5, the physician cannot sign the declaration because the physician cannot conclude that the conventional drug is “ineffective”: though not as effective as cannabis, it is nonetheless effective, such that the physician cannot sign the declaration, and the patient cannot obtain the medicine that would reduce his pain to level 5. Thus cannabis is to be authorized by the physician only as a “last resort”. Counsel for the CCLA pointed out that, given this regulatory requirement, even Terry Parker – who was present in the courtroom, and who was held to be constitutionally entitled to use cannabis medicinally in 2000 – could not now obtain a physician’s signature. “ The third attack on the eligibility conditions of the MMAR, and the one focused on in the argument before us, rests on the requirement that the physician support for a medical exemption for individuals in category 2 and category 3 must come from specialists. Again, the Hitzig applicants make two arguments in mounting the attack. First, they say that because marihuana is an untested medication there is no justification for requiring medical support beyond the individual’s own general practitioner since the specialist has no knowledge advantage. They say that when this is combined with the practical difficulties that exist in accessing specialists, particularly in rural areas, the specialist requirements for categories 2 and 3 constitute an unreasonable barrier which significantly interferes with those in medical need from accessing the medication they require. In short, Justice Doherty was saying that, even prior to the amendments in 2005 brought section 6(e) into existence, there was a similar requirement that the physician stated that all conventional treatments had been tried or considered and found medically inappropriate. Counsel for the CCLA replied that the court in Hitzig was not dealing with the “last resort” argument. Rather, it was dealing with the requirement of having the support of a specialist. Therefore, submitted the CCLA, any comments about the criteria were obiter to the “last resort” issue. In effect, comments about the criteria do not now stand as binding precedent upon the court in this case with respect to the “last resort” issue. Counsel for the CCLA wrapped up with submissions concerning statistics that show willingness of physicians to sign declarations differs across the country in regions having similar populations. Again, implied in the argument is the assumption that differences are accounted for not by differences in the number of patients medically eligible to use cannabis, but by other, non-medical factors affecting physicians’ decisions in different regions of the country. Regrettably, the courtroom microphone system did not amplify speakers’ voices adequately (if at all). This was unfortunate, because Ryan Dalziel, counsel for the B.C. Civil Liberties Association (“BCCLA”), spoke both quietly and quickly (the latter possibly owing to the rather limited time each intervenor had been allotted to make its submissions). The result was that this author, and at least one other observer I spoke with, missed much of what counsel for the BCCLA was saying (which is not to imply that the court had any trouble hearing him). Apologies, in advance, to the reader should the following account be a bit spotty, as a result. There was a discussion about paragraphs 138 and 139 of the Hitzig decision. In part, counsel for the BCCLA submitted that the language in that case has to be acknowledged to apply to the issues in that case, not to the issues in the Mernagh case. Counsel for the BCCLA submitted that the decision in R. v. Ferguson overtakes the decision in Hitzig with respect to the issue of whether a law should be struck down if it violates the Charter rights of only one individual. Citing paragraphs 49 to 73 of that decision, he concluded that if a scheme to provide patients with a medical exemption from cannabis prohibition is “illusory” even for only one person, the correct remedy is to strike the offending provisions of the Controlled Drugs and Substances Act. In response, Justice Doherty referred to the Supreme Court of Canada’s 2005 decision in Chaoulli v. Quebec (Attorney General). In that case, Canada’s highest appeal court struck down Quebec legislation that banned private health care alternatives to the government a health care monopoly because the monopoly was failing to provide adequate health care to Quebecers. Justice Doherty asked: if the system doesn’t work for just one patient, are you saying the correct remedy is to strike down the whole system? Counsel for the BCCLA replied “Yes, strike the ban, if the legislation is the problem”. Justice Doherty asked if Counsel for the BCCLA knew of any cases in which a system’s failure to serve a single person led to the striking down of the system, and he asked if counsel thought there is any government system that would survive were that the approach taken by the courts. His point: that no government system is perfect, and there is always at least someone who a government system fails. Wrapping up the BCCLA’s submissions, counsel submitted that there is no way to ensure the integrity of a system in which non-state actors play a role such as that played by physicians in the MMARs. He submitted that the court should consider whether the MMARs, by making non-state actors a part of the system, exposes individuals to an arbitrary loss of their defence to criminal charges of possession and cultivation of cannabis. Three HIV/AIDs organizations intervened collectively. Their lawyer, Paul Burstein, had represented Warren Hitzig and seven others in the 2003 appeal before Justices Simmons, Doherty, and Goudge. Burstein compared and contrasted the Mernagh case with paragraphs 95, 98, 99, and 129 from the 2003 Hitzig decision. He submitted that the process the government has set up is “manifestly unfair and arbitrary”. Justice Doherty remarked that the idea of having a registry of physicians who are willing and able to evaluate a patient’s eligibility for cannabis use “makes practical sense” and he asked Burstein whether or not his group has a list of such physicians. Burstein replied in the affirmative, but added that the viability of their system depends upon what information they can get. In some towns, there is no way to know who is such a physician, and no way for locals to learn the identity of such physicians. Burstein continued with his submissions, saying that the Crown submits that only those patients with a proven right have the constitutional protection against conviction under criminal laws against cannabis possession and cultivation. The MMARs, he said, are suppose to facilitate an advance investigation of eligibility so that patients can avoid the commencement of criminal proceedings against them. 3. Reliance on “doctor shopping” means that the MMAR is arbitrary and contrary to the principles of fundamental justice. The Crown, said Burstein, says the Charter does not apply to decisions of doctors, but legislation gives the Minister no power to override a doctor’s decision. The Supreme Court of Canada has found that to be wrong, he said. Burstein submitted that the lack of procedural safeguards in situations where a physician improperly refuses to sign is contrary to fundamental justice. He said there are “serious procedural deficiencies” with the MMARs. For example, nobody can review a physician’s decision even if it is unreasonable and even if the physician simply refuses to sign declarations. Apart from doctor shopping, there is no mechanism of review. Citing the Supreme Court of Canada’s decisions in Chaoulli and Morgentaler, Burstein submitted that doctor shopping involves considerable delay. Moreover, submitted Burstein, there is no regulatory requirement that doctors provide reasons for not signing a declaration, yet the Crown submitted that patient evidence of why doctors refused to sign is hearsay. In response, Justice Doherty replied that the same is true when a physician refuses to prescribe other drugs. Burstein acknowledged that, but submitted that, with prescription drugs, there is a higher risk due to higher levels of toxicity. Also, he said, cannabis prescription/non-prescription occurs in a different context. Justice Doherty said that the “fundamental issue” between the appellant and the respondents is the question of whether this is a medical decision. Burstein, in response, submitted that it is not a medical decision. The MMARs do not accomplish medical scrutiny, he said. The MMARs place no value in a doctor’s refusal to sign. If the MMARs were really interested in medical scrutiny, surely the refusal of a doctor to sign a declaration would carry some weight under he regulations. Yet the MMARs do not care how many physicians refuse to sign for a given patient. If many physicians refuse to sign for a patient, and then the patient finds just one physician who does sign the declaration, the MMARs are content that that signature establishes the patient’s eligibility for an exemption. It’s not about whether it is a reliable determination. The government just wants some physician to sign the declaration so that the government has plausible deniability, said Burstein [Note: this author infers that Burstein meant that, should other countries object to an individual being allowed to possess or cultivate cannabis, the doctor’s signature gives Canada an excuse for not charging the individual criminally). Turning to the issue of an appropriate remedy, Burstein addressed primarily the issue of what should happen if the court strikes down the provisions in question but suspends its decision for some period of time. If there is such a suspension, submitted Burstein, it should provide that before any charges are laid upon a person under the impugned provisions, the police/crown should have to wait until the periods under section 24 of the Controlled Drugs and Substances Act expire. That would allow a person making a medical claim to go to court to seek the return of his cannabis, if it has been seized. The Crown indicated it required only about five minutes to reply to the submissions of Respondents’ counsel. With respect to the decision in R. v. Parker, Mr. Parker in December of 2011 had come before the court seeking the return of cannabis that had been seized by police. The court’s response was that the MMARs require renewals of ones certificate of exemption, and Parker had failed to obtain a renewal, such that he was no longer exempt. “60 Section 24(1), by contrast, is generally used as a remedy, not for unconstitutional laws, but for unconstitutional government acts committed under the authority of legal regimes which are accepted as fully constitutional: see Eldridge v. British Columbia (Attorney General),  3 S.C.R. 624; Multani v. Commission scolaire Marguerite-Bourgeoys,  1 S.C.R. 256, 2006 SCC 6. The acts of government agents acting under such regimes are not the necessary result or “effect” of the law, but of the government agent’s applying a discretion conferred by the law in an unconstitutional manner. Section 52(1) is thus not applicable. The appropriate remedy lies under s. 24(1). In other words, the crown was suggesting that the MMARs and the challenge laws against cannabis possession and cultivation should stand even if an eligible patient like Matt Mernagh cannot get the signed declaration he needs to obtain the exemption. Instead, suggested the Crown, such a patient must come to the court and seek a personal remedy against the government to relieve his particular situation. The court said it was reserving on its decision. In the meantime, the status quo is to prevail in respect of Matt Mernagh’s stay and his right to possess and cultivate his cannabis for medicinal uses. Hello all, This is Phillip Silver writing on the lack of willingness of doctors in London,Ontario supporting the MMAR forms from Health Canada’s MMAR program .For about 10 years now I have been trying to get the MMAR forms filled out to legally access marijuana to treat the chronic pain I suffer with throughout my body also to use it to increase my weight -as I have suffered for many years a eating disorder that causes me to have total loss of apatite .Currently I am 6’1 and 125lbs it is not only scary that I’m wasting away but also it is scary the lack of participation to rectify the situation through natural treatment.After trying so many different types of pain killers and anti depressants I have had no positive results from them .When I had the MMAR papers properly filled out and was prescribed 5 grams a day oral or inhilation I thought that I could finally move forward with a less harsh natural treatment to treat my conditions.After waiting on the final step of the application ,passport photos signed -They had been returned unsigned keeping me from submitting the MMAR forms .When I asked to be sent to another doctor that would continue with what Dr Boyd had started …I was told to continue this issue with my family doctor who is morbidly against marijuana calling me a lazy dependent of marijuana .After that I had phoned the London Compassion Center on the issue and explained my situation and that I had already been prescribed marijuana by a chronic pain specialist -I was told that they had been advised not to point anyone in the direction of a doctor that would help or offer any further help on anyone legally accessing marijuana or having the papers filled “keep in mind I was only needing my passport photos signed to finalize the forms .Then I took it upon myself to contact Health Canada’s MMAR program supervisor direct upon doing so I was told after explaining my situation to the supervisor that If my specialist that filled out the papers had gotten so sick he had to close the practice before signing the passport photos ,That I would have to restart the whole process all over dispite the fact that It took me 10 years to find any doctor that could fill out the forms to begin with .When I inquired on how I was going to find a doctor here in London,Ontario to fill them out and explained how difficult it was to have them filled out -The answer I received was “grab the phone book and start calling doctor offices asking if they have a doctor that supports marijuana”Not only is this misleading but unpractical considering that this is part of our medical legislation .After continuing to search for a doctor to help me in filling out the MMAR forms once again .It would seem the more I looked for a doctor to support it -the more I kept hearing from doctors that he was the only known doctor in London,Ontario that was willing to fill the forms out ,and since he got sick and had to close his practice i’m left here to believe that there is no way to have the forms filled out in London ,Ontario .How can someone take the legal way to access medical marijuana if no doctors are willing to fill out the forms that were placed into our Canadian medical legislation?Is this some kind of weird trap or sting operation London is using to try to lay more charges to those trying to treat there symptoms using this area of the legislation ? Seems weird doesn’t it ? Anyways ….to keep us here in London,Ontario from being able to access legal marijuana though Health Canada’s forms -is to keep us in pain against section (7) of the constitution .Also violates are rights and freedoms to belief and choice to use a less harmful more natural way to treat the symptoms we face.After being posted in the London Free Press on my court case stating how i’m sick and how horrible I look -and how i’m getting a break? Then I took it upon myself to contact them to do an article on my story on why I had grown the 25 plants to treat my symptoms -the amount was found on a chart according to the amount that I was prescribed to use .Was all new to me and was a first time that I had ever tried to grow -yet they had stated that it was a sophisticated grow op ….It was a ballist and a light bulb above the 25 pots .not sophisticated at all -the plants were 10 inch approx ,also I had no idea If I was even growing them well . Since the court case I sit in my house on a conditional sentence for 8 months with the ban of use of marijuana-keeping me in pain-and also a 10 year ban of weapons wich I have never been involved with any or even have a charge in the past ,not any charges in the past also they throw a alcohol ban on me -wich is fine I don’t even drink.Like so many here in London,Ontario that try to access the MMAR program I continue to be ridiculed and sterio-typed against and am left feeling that I don’t have equal rights or the freedom of my own thought and beliefs like everyone else on thier own thoughts and beliefs .Why is Canada picking on me ? Can anyone help me feel like I have rights again ? up till now I just feel victim to a system,that obviously does not work. Thank You to all . Also, the Prohibition of Cannabis has led to people creating Synthetic spice (ie: K2 Spice) which is resulting in catastrophic health issues in young adults and teens through out the USA and maybe even in Canada. I asked my doctor and gave him the app and the waiver he said he would look in to it. At my next appt he said he took the matter to the ethics board and was told that he would open himself up to rev can audit, and did not want that. So I went to MM.ca with with my MRI that says I have Osteoarthritis. I got doctors appt and was told that she was filing a B2 app for me because Osteoarthritis is not a B1 illness and that I may be Rejected because the doctor at the pain clinic that sent me for the MRI is not a registered specialist as required on a B2 app. 2 Months later I received notice form Health Canada to find a specialist. Its now 2 Months later I have sent out 4 referrals from my doctor and only one has responded with a refusal of the referral saying simply I can not Help this patient. I have read the transcripts all talk was about finding a Doctor to file the judge did not here anything about patients being forced to find a “specialist” when a GP has already filed your App. there is no mention in any of the cases about waiting 8 months to get a appt if you can. I have specialist report stating Chronic pain due to osteoarthritis and doctor has stated cannabis as a pain reliever, health Canada has denied report because doctor is not a Royal Colleges of Physicians degree. My Doctor is now trying to convince them on the merit of the specialist, and in all this I asked my Doctor about Her Contact at health Canada and if there is any Medical people there she said no, How in the heck is it Legal for a unlicenced persons to be making decisions on My HEALTH CARE.The law was struck down because patients are unable to find a Doctor to sign the app, I have 2 Doctors that are recommending cannabis. Just had it out with Health Canada, They are not budging Royal Colleges of Physicians degree or NO ACCSESS!!!! I am Just a guy in pain trying to continue to work and take care of my disabled wife and by the way it takes her 8-10 months to get a specialist. It really is a case of the compassion of medicine hitting the burecrtic brick wall.